Soooo. This was not at all what I expected. This is another one of those "It's on the list! You must read it!" books, and knowing I was short on time, and knowing it was one of the few on the list that my library has in audiobook, I decided to go that route. Which was, I think, an excellent decision. I am kind of on an audiobook roll here, my friends. This makes two audiobooks that I have listened to the whole way through in less than a month. Now, no, this wasn't what was advertised to me when I first came across this title. I've been lead to believe that Bryson is hilarious, laugh-out-loud funny, that this was a sort of slapstick comedy of errors. I also thought this was the unabridged version, and suffered the same sort of unpleasant shock as Nan when Bryson calmly announced the name of the abridger at the end of the final disc. Well damn, I thought, no wonder I was sorry it was over so soon. At 5 discs, this audiobook is very much on the light side for adult-length audiobooks. And I really was sorry it was finished, experiencing an almost physical pang when I slipped that last disc out of the player. So no, it's not LOL hi-larious, though there are points where I admit to a surprised guffaw. I did smile an awful lot, for someone on an hour long commute desperate to get home. Bryson's sense of humour is not slapstick or obvious. It is dry, subtle, gratifyingly humble, and self-deprecating to the extreme. I think I only had trouble getting used to it because I was expecting something much different. Also, Bryson spends much of the time being quite earnest and serious, though never entirely humourless, about his topics: the trail itself, hiking in general, bears, the devastation wreaked in the name of the US Forest Service and the US Parks Service, the lack of pedestrians and pedestrian-friendly spaces in the US, and you get the idea. 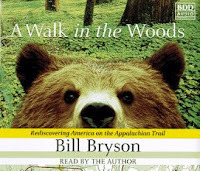 These musings on the State of the Union as Bryson saw it (the book was first published in 1999) and in particular on the Environmental State of the Union are interspersed generously between the narrative from the Bryson's move back to the US after decades in the UK through the end of his summer of dedicated AT hiking. And all of it, bar perhaps a few paragraphs where the statistics and facts get a bit mind-numbing, is absolutely fascinating. One of my pet peeves in books about nature (as discussed before) can be an authors' tendency to slip in a horribly depressing fact ("this beautiful bird, a warbler of some sort AND WARBLERS ARE VANISHING FROM THE FACE OF THE EARTH DUE TO HUMANS, YOU BASTARDS is eating spruce budworm and calling to its mate") right in the middle of describing some experience or another. The first time Bryson switched into fact-relating mode, out of the narrative, I thought, Oh jeez. Not again. I got over it, though, largely because Bryson actually delves into the facts, fleshes them out, and creates a chapter of it; I don't feel ambushed, just enlightened. As I've said before, I have no problem with relating these facts -- it's just I don't like the way its normally done. I think Bryson's got the right idea: be clear about your intention, give me enough information to make an informed judgement, and for heaven's sake don't interrupt a narrative to scold me for a sentence before going back your merry way. His narration on this audiobook also took me a bit of getting used to; he has a very odd accent and his delivery seems at first almost unbearably flat. Stick it out, because there's something about his reading that is deeply approachable and very genuine, when it's not downright hypnotic. I can hear his voice in my head this minute. I suspect, though I can't know yet, that this audiobook has changed something about the way I experience hiking fundamentally. It's also made me think seriously about trying some backwoods hiking myself because I actually think I probably could do it. I've camped before, I've done canoe trips (without portages) before, I've done a bit of hiking though never more than day-trips. Bryson doesn't make backwoods hiking sound appealing, exactly, so much as magnetic. He gets to the heart of the difficulties, the long stretches of monotony, the real and imagined dangers, and the flashes of absolute brilliance that make backwoods trekking so captivating to a certain crowd. I really, really loved this audiobook, and I'm very grateful that having it assigned for reading meant I actually listened to it. I'm keen to read the unabridged version at some point, but I think I'll probably find myself looking for more of Bryson's audiobooks, abridged or not, in the meantime.